The largest mass shooting in the history of the United States took place during the night of Sunday, and is now known that the gunman Omar Mateen is responsible for at least 63 dead and some 43 others injured in Pulse nightclub in Orlando, Fla.
And while it's sad what happened, there is a church that celebrates this horrible act of terrorism. 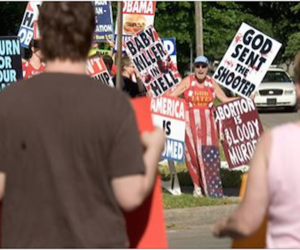 Westboro Baptist Church used social networks to celebrate the shooting and posted "God sent the shooter." Westboro Baptist Church believes this was a message from God, and also that the mass shooting is "fair punishment for the Sodom of America!"